Trilogy at La Quinta brings luxurious Shea Homes active adult living to the heart of the Coachella Valley. This 1,238 home community is revered for its finely-crafted upscale homes and world-class amenities that include two amenity centers, an 18-hole golf course, full-service spa and continuing education classes. Trilogy at La Quinta is tucked against the Santa Rosa Mountains along the southeast corridor of the Coachella Valley. The community is only 35 miles from the famous attractions in Palm Springs. It is surrounded by highly acclaimed communities like PGA West and The Quarry. Trilogy at La Quinta was designed to be uniquely different from other large-scale active adult communities in the area. A sophisticated level of detail has gone into every aspect of the community. The diversity of housing options and exterior facades gives the community a semi-custom appearance. Trilogy at La Quinta also offers an enviable lineup of amenities and lifestyle activities not typically associated with average active adult communities. The 21,000 square-foot Santa Rosa Club is the central hub for all community activity in Trilogy at La Quinta. The finely appointed clubhouse provides the ideal place to stay active or simply relax with friends. It includes a state-of-the-art fitness center that has the latest cutting edge weight and cardio equipment. The aerobics and dance studio and an indoor walking track offers active adults the opportunity to explore other exercise regimens. Other amenities in the Santa Rosa Club include craft and hobby studios, a grand ballroom, computer lab, library and a billiards and table tennis room. Additionally, the Cafe Solaz in the Santa Rosa Club is a cozy atmosphere to read the paper while enjoying a cup of gourmet coffee or a fruit smoothie. The cafe has computers with Internet connection and Wi-Fi for laptop users. The sterling amenities continue outdoors with a beautiful resort-style pool for relaxing with friends. There are also four lighted tennis courts, two bocce ball courts, and a horseshoe pit for enjoying some friendly competition with your neighbors. The Coral Spa at Trilogy is a full-service spa offering the latest indulgent treatments typical of a five-star resort. Residents can enjoy massages, body treatments, waxing, tinting and nail services. Trilogy at La Quinta is also home to the 4,000 square-foot Coral Mountain Club. Also referred to as the Creative Arts Center, this clubhouse has arts and crafts studios, a ceramics studio, and a card and game room. The Coral Mountain Club also provides active adults with a 25-seat movie theater for a quiet night with friends and a catering kitchen for community gatherings. The Coachella Valley is acclaimed as one of the top golf destinations in the world. The Trilogy Golf Club at La Quinta is no exception. The 18-hole championship course designed by Gary Panks has played host to the PGA Tour Skins Game. Both pros and weekend novices cherish Trilogy as one of the most challenging and rewarding courses in the region. After an exciting round of golf, the Bistro 60 restaurant and bar in Trilogy at La Quinta is a great place to enjoy a relaxing lunch and cocktail with friends or an elegant dinner with your spouse. Many evening events make this an ideal setting for mingling with neighbors and meeting new friends. Homebuyers in Trilogy at La Quinta can select from 12 single-family ranch-style floor plans that range from 1,381 to 2,769 square feet. These homes provide active adults with two to three bedrooms, two to three-and-a-half bathrooms, and an attached two to three-car garage, perfect for the downsizing couple or those looking for a bit more space. The Shea designed homes are built with some of the latest luxurious finishes and high-end upgrades. Shea's "green" building process incorporates eco-friendly materials and energy saving systems such as solar panels, Energy Star appliances and the use of sustainable building products. Trilogy at La Quinta offers its residents a vibrant lifestyle complete with dozens of clubs, events and fun activities. Whether your passions include sports and fitness or leisure and social activities, there is something for everyone at Trilogy. There are several fitness classes available for Trilogy at La Quinta residents, ranging from Tai Chi to tennis to hiking. Attending the happy hours or community parties are great ways to meet new neighbors and picking up a new hobby is easy with clubs ranging from cooking to needle working to photography. Interested in picking up another language, re-allocating your investment portfolio, or expanding your photography, wine tasting and culinary skills? The Trilogy at La Quinta's Center for Higher Learning offers all sorts of enticing options to help you grow your mind. The on-site institute is designed to meet the continuing education desires of active adults. Highly accredited instructors and guest speakers, many of which are Trilogy residents, provide a college-like environment right in your own backyard. 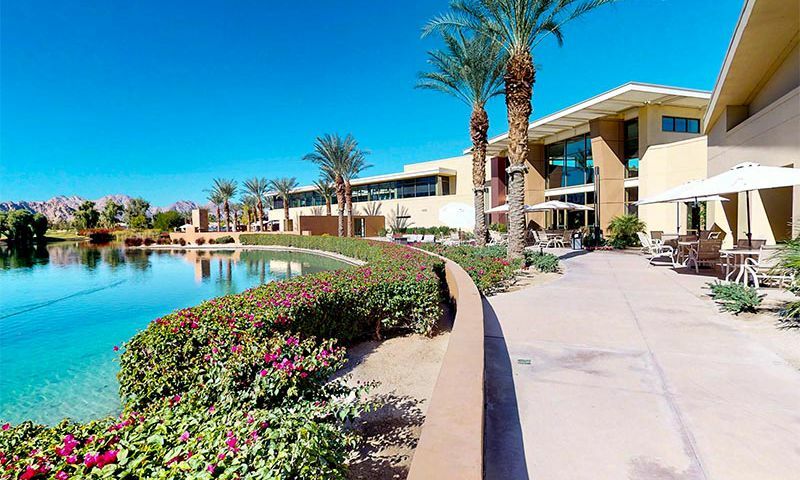 For residents whose life is defined by the world outside of their home, the area around Trilogy at La Quinta is a recreational and cultural paradise. The Palm Springs area is renowned for great shopping, world-class resorts and fine dining establishments. The famous La Quinta Resort & Spa is just down the street. The surrounding mountains are filled with deep valleys and scenic ridges ideal for hiking, mountain biking, camping, horseback riding and Jeep tours. Nearby, several National Parks such as Joshua Tree are great destinations for adventure lovers. Whether you like to fill your backseat with golf clubs, shopping bags or a backpack and hiking boots, there are attractions for every active adult to enjoy in the Coachella Valley. For longer trips, the Palm Springs International Airport is approximately 30 miles away. Trilogy at La Quinta has the luxurious home styles and incredible amenities to make any active adult busy and satisfied in the Palm Springs, California area. The Santa Rosa Club is Trilogy at La Quinta's center for social and physical activity and features a wide range of indoor and outdoor amenities. Santa Rosa Club - 21,000 Sq. Ft.
Coral Spa at Trilogy at La Quinta is adjacent to the Santa Rosa Club and offers several services for residents. Coral Mountain Club is an additional building that houses amenities for Trilogy at La Quinta residents, including a movie theater and arts and crafts rooms, leading some to call it the Creative Arts Center. Coral Mountain Club - 4,000 Sq. Ft. The Golf Club at La Quinta offers 18 championship holes designed by Gary Pansk. It also houses an on-site restaurant and a pro shop. There are plenty of activities available in Trilogy at La Quinta. Here is a sample of some of the clubs, activities and classes offered here. If you like all of the design features and look of larger collections, but would prefer a bit smaller space, the Coral Collection may be perfect. These unique designs maximize all available square footage, and the result is a cozy feel that acts surprisingly large. The Mariposa Collection is among the larger collections, and like the Santa Rosa Collection, each home offers plenty of room to relax alone or with friends. Many people like the Mariposa Collection because it combines a large interior space with a slightly smaller footprint, leaving more room for some outdoor creativity. The Santa Rosa Collection is designed for those whod like a little more space to spread out, and come complete with not just amazing master and guest bedrooms, but also grand entertaining spaces. These homes are perfect for those looking for a larger indoor space. Things are not as they were in 2013.I used to say if you gave me a pad and paper I couldn’t think of anything to complain about, but since the new management service took over, First Services, things have changed for the worst, HOA dues have increased and they won’t stop there. Buyer beware. Great active adult community in the desert! I love the workout facilities and the updated clubhouse. The view of the mountain outside is awesome. Trilogy LaQuinta is a true luxury golf course community. A lot of other places claim to be "luxury" but you will be hard pressed to find everything you get at Trilogy anywhere else in the area. The golf here is fantastic. The clubhouse has everything you could want (restaurant, fitness center, spa, computers, pool tables, a walking track, 2 pools). My wife and I wanted a quality built home, not just another cookie-cutter house. Our new home here is our little piece of paradise in sunny California. 55places.com is not affiliated with the developer(s) or homeowners association of Trilogy at La Quinta. The information you submit is distributed to a 55places.com Partner Agent, who is a licensed real estate agent. The information regarding Trilogy at La Quinta has not been verified or approved by the developer or homeowners association. Please verify all information prior to purchasing. 55places.com is not responsible for any errors regarding the information displayed on this website.